Here are a few more tips and ideas for Assignment 19: Blue Hour I posted earlier this week. If you have some, please, share with us in the comments below. Blue Hour photography requires long exposures. A tripod is the best way to secure a camera for long exposures. Even if you own a point and shoot or phone camera, a tripod is the way to go. I have substituted bean bags, tops of garbage cans (I call them Quadpods) and other flat surfaces with varying degrees of success. I have talked about when Blue Hour starts in the past. There are no firm rules and weather plays a big role. Apps like LightTrac for iOS and Android devices will tell you when Civil Twilight starts. Though not exact, it’s a good indication within a few minutes leeway before and after to plan your photography. Once your camera starts to pick up deep blue sky color, look around you to see if you can detect it. What I found was the black night sky I always saw before was now different shades of blue depending on how far before or from the sunrise or sunset time and location I was looking at. 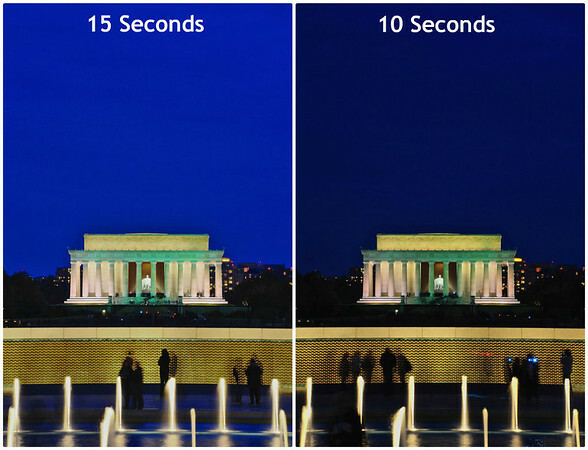 You can control the amount of blue in your Blue Hour photos by changing the shutter speed. Below are two photos taken a few seconds apart at f/16 and ISO of 200. Only difference is the shutter speed. Lincoln Memorial photographed from the World War II Memorial at night in Washington, DC. I shared the photo on the left with you last month as I prefer the brighter blue. Some people my like the Midnight Blue from using a shorter shutter speed. Remember to try different exposures when you are photographing during the Blue Hour. I really like photographing Blue Hour with buildings and lights around. I like how the blue and artificial lighting go together. I would really enjoy seeing some natural landscapes so I hope some of you will be trying some for the assignment. I hope these Blue Hour bits of information will help you in this month’s assignment on Blue Hour. This entry was posted in Photography, Travel and tagged "washington, blue hour, dc", fountains, lincoln memorial, memorial, night, water, world war ii. Bookmark the permalink. You’re welcome! Looking forward to your photo(s)! Blue Hour sounds like a magical photographing hour. Someday I will pause and share this sacred space. Thank you for sharing this for us–so when we’re ready–we’ll share it with others as well. What a great idea and point to make. I am only now really getting into using my tripod and this is a great opportunity to take. I will have to check out the assignment next. Would love to have you join in, Rachel! Spread the word!